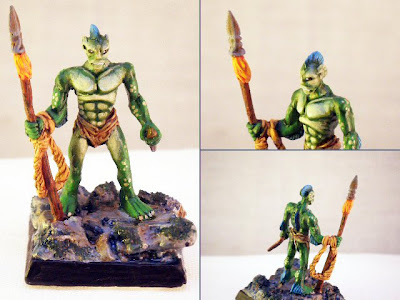 The Nauticans for Warhammer Fantasy Battle: Look what I found... something a bit fishy ! Look what I found... something a bit fishy ! 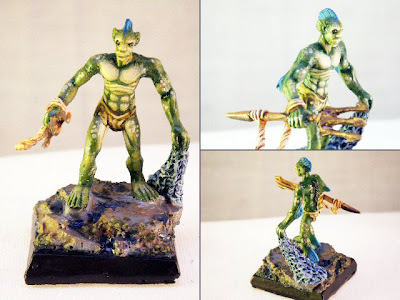 Some pretty cool miniatures for a seaborne Warhammer army heh ?! I spotted this miniature supplier on coolminiornot when I was promoting the Nippon Fantasy Army Book. I'm going to order a couple and see what they look life in real life, so to speak. Images from secretskeletonminiatures.ecrater.com used without permission, all right reserved. You can color them Cyan, I think they really look like Wave Breakres & the Trident Guard. I also prefer a bluey/cyan type of colour rather than the green above. Well I kinda like Green, but for these kinds of guys (aquatic) I prefer Cyan or Blue. A question: How many of these do you get in a set? So, do they look like the Wave Breakers/Tripoon Battery Crew. I think you can only buy them individually. I guess they might make decent Wavebreakers or... possibly a new unit altogether. I originally had a unit called Tide Watchers but I got rid of them mainly because I couldn't find any suitable models with nets. Obviously the guy with the Trident & Web. Aha ! You were spot on Nikola. 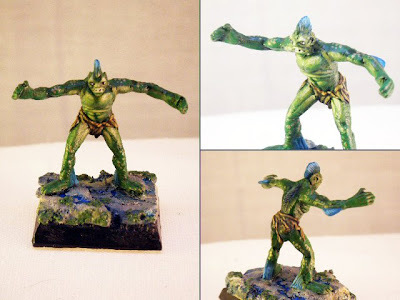 I had forgotten about these minis. Thanks for reminding me.